What to choose – Timbeter’s monthly subscription or picture based package? For Timbeter’s team, it’s important to understand the user’s needs and to give guidance through the best way to measure logs. This means that, with our experience, we make measurements easier and more accurate for people who work in the fields, industries and ports. When you download Timbeter, we offer you the 10 first measurements for free, so you can understand how the solution works and test the different functionalities. 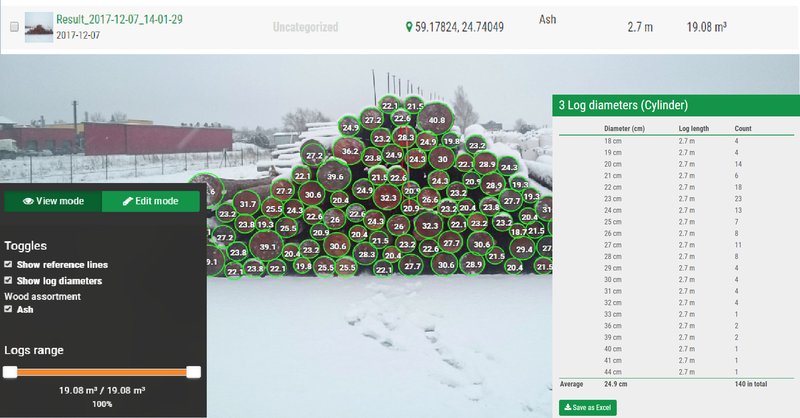 This enables our users to have a first contact with the tool, besides experiencing and comparing the method with traditional log measurement. For companies who are interested conducting tests on larger scale, we are also happy to offer free trials from 7 to 14 days. During the testing period, our support team helps users to understand the functionality, overcome any problems and challenges and make sure that users get correct results. After the trial, it is finally time to decide which package to choose: monthly subscription or the picture-based package? Monthly subscribers have no limit on the number measurements. They can all different regimes (pile, diameters, panorama, truck, pile density). This is very suitable for companies who are dealing with many measurements on a daily basis and want to use Timbeter for different functionalities at the same time. For large companies with several devices, it is important that all information is stored under one account, where the management can have real-time overview of all the activities taking place. Once the storages are set, it’s also possible to add new users to it, so all the roles are well organized inside the company, making the measurements, the data available and processing it even quicker and more accurate. From Timbeter’s storage it is easy to customize everything according to your company’s needs: add species, wood qualities and assortments. All the information is synchronized with the devices connected to the account, so you can be sure that your own company’s specifications are incorporated into Timbeter’s app and storage module. For example, if you accept only certain range of diameters or you have different assortments like “A”, “B” and “C”, then everything can be set from the storage module. You can also add your own tree species, which will be set with the application after syncing. Users with monthly packages have no limits on the number of storages or number of users accessing the storage module. This way, you can make sure that all the accountants or logistic managers have access to the needed information in real time. Another important point is that, by using the Storage Module, you can download the reports in Excel of PDF format and see the active storage status, plus always have comparable data for inventories. All the data can also be shared with your team and with partners, lowering the number of claims and turning the everyday tasks more pleasant and accurate. To summarize: if you make more than 50 measurements per month, if you need to manage the data and need more than one device in your account, then it is wise to go for the monthly subscription. To start a monthly subscription you can easily email to info@timbeter.com. Payments can be done either via bank transfer or PayPal. For the ones who are measuring a few piles or have a temporary storage compilation, the most suitable option is to purchase the picture based package, depending on your needs. We offer 5-, 10, 20 and 50 measurement packages and you can use the measurements during one year. Purchases can be done directly from the storage module via credit card. If you don’t have a credit card, then our billing team can help you with the invoice – just write info@timbeter.com. Which is the most suitable plan for you, still in doubt? Contact our team on http://www.timbeter.com/contact/ and get the best advice for your company needs.